This entry was posted in Dalmatian Coast, Pearl of the Adriatic, Photo of the Day, Recommendations and tagged Cavtat, Croatia, Dalmatian Coast, Dalmatian Wine, Dubrovnik, Dubrovniklady, European travel, Hidden gems by Cavtatlady. Bookmark the permalink. Guess we need to plan a return trip so we can spend quality time on the Riva. 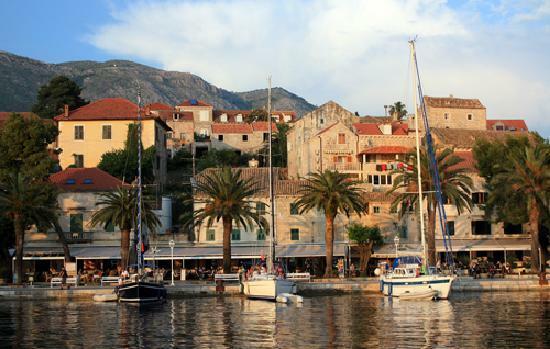 Oh, Cavtat, it is so lovely. We love to sit and have coffee right there everyday. We will be back in September and we cant wait! Please keep bringing on those photos! Also, the wonderful ideas for the salon and barbershop in Dubrovnik. Thank you, I love writing about special people. You can always invite me to join you in September, any excuse to visit the Riva. I love this… it’s so gorgeous! Just by looking at the photo, I can feel how relaxed life is there. Life moves very slow and easy, could not be better for me. Carol …..hold onto that lovely sunshine … we’ll be there on Friday for nine days! Looking forward to a swim at gradska plaza. Good luck, the water temp is only up to 15C, still very cold for me. But then I do not even think about swimming until late July when it’s up to 23C.